I love slow cooker meals! Most are so quick & easy to put together and by the end of the day you have a delicious, hot & flavorful meal to enjoy with your family. This recipe for Easy BBQ Ribs takes very little time to put together because it only requires 3 ingredients. Extra napkins required for this meal but it’s worth every bite! This recipe is so easy to make because it only has 3 ingredients. My favorite side to enjoy with ribs are potatoes like mashed potatoes, loaded stuffed potatoes, even homemade fries. If you’ve never used liquid smoke before, you’ll find it in the BBQ sauce section of your local grocery store. Super easy to make with just 3 ingredients. By the time the ribs are ready to serve, they are falling off the bone and loaded with flavor. Cut ribs into three-rib sections. Place the rib sections into the slow cooker. Drizzle ribs with liquid smoke. Drizzle ribs with barbeque sauce (using about 1 cup of the barbeque sauce). Cover and cook on Low for 7 to 9 hours or on High for 3½ to 4½ hours, until meat is tender. Using tongs, carefully remove ribs from slow cooker and arrange, meaty side up, in a single layer on prepared baking sheet (baking sheet covered with foil). Brush ribs with remaining barbeque sauce. Broil for 5 to 7 minutes or until ribs are crisp (be careful not to burn). Discard extra liquid in the slow cooker. Return ribs to the slow cooker, cover and set to warm for serving. Those of you who have been following Moms & Munchkins for a while now know that I love everything to do with parties…except maybe the dishes because who loves cleaning dishes, right? 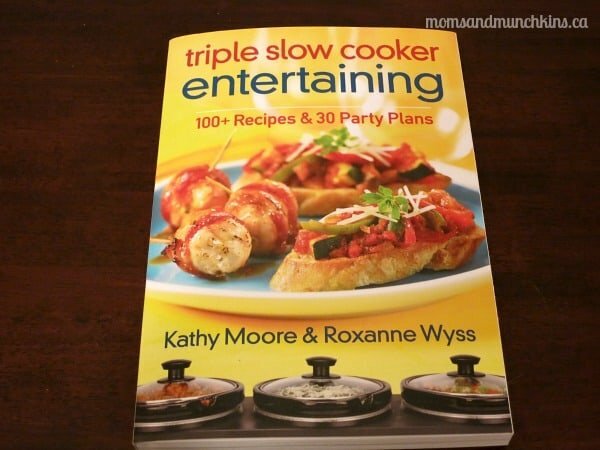 I received the new Triple Slow Cooker Entertaining Book by Kathy Moore & Roxanne Wyss and was excited to give some of the recipes a try. What makes this book different from other recipe books is that it gives suggestions for slow cooker meals to put together to create a delicious party buffet! The book also provides party planning tips for a variety of different party themes including make-ahead suggestions, decoration ideas and more. To learn more about this book or to purchase your own, visit RobertRose.ca. *Disclosure: I received a copy of this recipe book in return for an honest review. All opinions expressed here are my own. Great Slow Cooker round-up. Thanks for sharing at Simple Supper Tuesday. What a wonderful site! I love the great recipes. And, I am a slow cooker mom! Thanks for the great recipes! Found you on Katherine’s Corner! Thanks for stopping by! Yes, I love slow cooker meals too. Most of them are so easy to put together. What a great cookbook! I love my slow cooker and I love entertaining. I love how these authors put that together for us. I’m getting a bit of a reputation for always having meatballs in my crockpot when I entertain. Wait till they try these spicy meatballs. 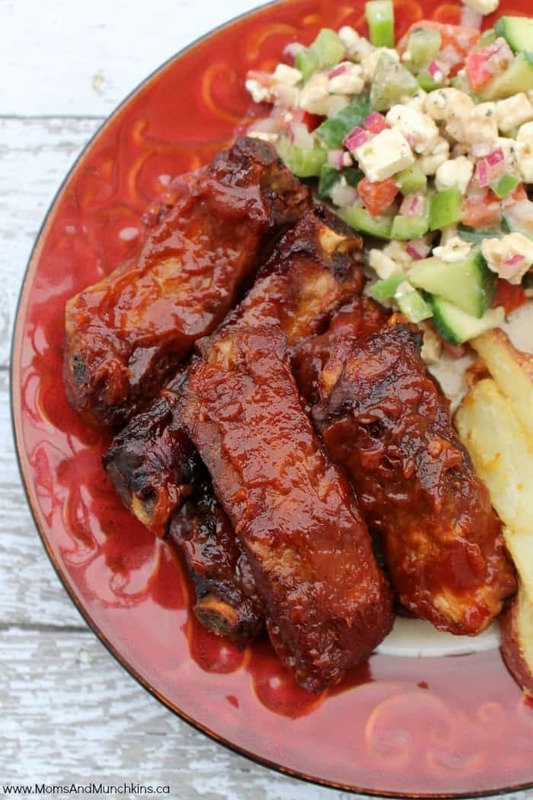 Ribs are such a perfect summer BBQ dish and a slow cooker version at that, yes please! Thanks for sharing and thanks so much for linking up to Thrifty Thursday!